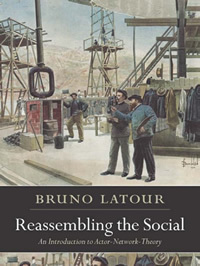 Reassembling the Social: An Introduction to Actor-Network-Theory, Oxford University Press. Pierre Lemonier ed., Technological Choice: Transformations in Material Culture Since the Neolithic, London: Routledge and Kegan Paul, 372-98. Andrew Barry (2001). Political Machines: Governing a Technological Society. London: The Athlone Press. Annemarie Mol, 2002. The Body Multiple: Ontology in Medical Practice, Duke University Press. A Turn to Ontology in Science and Technology Studies? 321-340 Steve Woolgar and Javier Lezaun, "The wrong bin bag: A turn to ontology in science and technology studies?". 341-362 Bas van Heur, Loet Leydesdorff and Sally Wyatt, "Turning to ontology in STS? : Turning to STS through 'ontology'". 363-378 John Law and Marianne Elisabeth Lien, “Slippery: Field notes in empirical ontology". 379-396 Annemarie Mol, "Mind your plate! The ontonorms of Dutch dieting". 397-416 Charlotte Brives, "Identifying ontologies in a clinical trial". 417-443 Noortje Marres, "Why political ontology must be experimentalized: On ecoshow homes as devices of participation". 444-462 Michael Lynch, "Ontography: Investigating the production of things, deflating ontology". Michael Lynch, 1992, Scientific Practice and Ordinary Action: Ethnomethodology and Social Studies of Science, Cambridge: Cambridge University Press. Stephen Hester & David Francis, ed., Orders of Ordinary Action: Respecifying Sociological Knowledge, Aldershot, England: Ashgate, 107-19.